My name is Deborah. I’m a wife and mother of two spirited little girls, Ella and Tessa, both born at home with the help of St. Jacobs Midwives. My first labour started as quite a surprise. I had technically reached full term and attended my 37-week check-up the day before, which meant I was now eligible for my home birth. 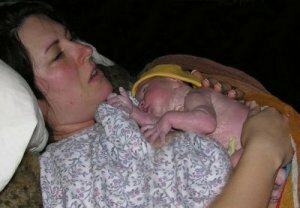 I have an aversion to hospitals and was very uncomfortable with the idea of giving birth anywhere but my own home so I had determinedly planned for a home birth from the outset. I read every natural birthing book available, including “Ina May’s Guide to Childbirth” and “Birthing from Within” (two of my favourites). That day, I had completed my final client project, which was a great relief. My husband and I attended his work Christmas Party. On our way out, our hostess remarked that I was “carrying low”. “I bet you’re going to have that baby soon,” she remarked. I laughed. “I still have another 3 weeks go to!” I replied. On the way out to the car, I noticed that my hips felt better than they had in a couple of weeks—they had been very tight and sore. Tonight, they felt looser. We drove home and went straight to bed. I couldn’t sleep—I was so uncomfortable—I’d been sleeping with various body pillows and other contraptions for weeks already. I retreated to sleep on two large bean bag chairs in our family room—they allowed me to burrow my way into a more comfortable position. At 2am, I woke up to warm wetness. I’m peeing. Am I peeing? Or for goodness sake, I’m peeing! Apparently another pregnancy symptom none of my friends had bothered to warn me about before I had embarked on this adventure—but, nobody had told me I would actually lose complete control of my bladder! I struggled up out of the bean bag (not easy in this state) and to the bathroom. Every time I rose off the toilet, there was another gush of water and I had to sit back down again. Finally, it dawned on me…this is not pee. I called my husband, Oliver, out of a dead sleep. The poor man staggered in and leaned against the countertop, dizzy—he was fighting the flu and looked very pale. “I think my water broke,” I told him. His face turned even paler. “Isn’t it too soon? What does that mean?” he asked, shocked, like he couldn’t wrap his head around it. “It means, one way or another, we’re having a baby in the next twenty-four hours,” I replied bluntly, strangely resigned. I hesitated at such an hour but then paged our midwife, Julie, and woke her up apologetically. I thought I should give her a heads-up, you know, in case my labour went quickly…. She told me that the contractions likely wouldn’t start for several hours so to go back to bed and get some rest as I would need it and to call her again when we woke up in the morning. Disregarding Julie’s advice completely, I instead proceeded to clean my kitchen and tidy the house. That’s the only disadvantage of a homebirth I can communicate—no advance notice and a messy house to clean up before the action starts. A high school teacher, Oliver went into our home office to prepare a lesson plan for his students and email it to his school with notice that he wasn’t going to be at work. I searched out my homebirth list and started steeping my herbs for the post-birth bath. We were completely unprepared! I gathered the stuff we did have into a laundry basket—shower curtain, sheets, towels, etc,…thank goodness friends had just given us a bag of hand-me-down newborn clothes and a couple of size 0 diapers they hadn’t used. About 3:30am, we went back to bed as advised. About 15 minutes later, my contractions started. So much for sleeping. Every fifteen minutes or so I would feel another one, like a strong period cramp. I dozed in-between until morning. By morning, I felt tired but calm. Julie came and said I was 2-3cm dilated and 50% effaced. Mid-morning, the contractions stopped completely for a while, which concerned me. I wanted progress! We ordered pizza and I ate a lot of it—carb-loading for the workout ahead. Oliver and I both dozed on the couch for a while. The day seemed to stretch on endlessly with nothing to do but wait. We decided not to phone anybody since no one was expecting news three weeks before my due date. We didn’t want anyone to worry. Mid-day, the contractions returned and strengthened with added pressure to the point that I began to feel restless and uncomfortable, pacing, focusing on each contraction when it came every 4-5 minutes. 3:30pm, Julie returned and stayed. I tried rocking on a labour ball—it helped ease the discomfort. Around 5:30pm, I became very nauseous, which felt terrible in addition to the regular contractions. I rocked, leaning my head against the cold granite countertop in our kitchen, miserably. Finally, I vomited up my pizza and felt sooooo much better! So much for the carb-loading. I interpreted vomiting as a good sign as I had read that it often marked transition to the next stage. 5:45pm: Cervix 100% effaced and 5cm dilated. All this time and only half dilated. Ugh. 6:30pm: We decided to go out to soak in the hottub in our barn (yes, our barn had a hottub in it, strange but true). The hot water felt fantastic. I leaned against the side of the tub with my chin on my hands and fully relaxed. Suddenly, I felt a strong downward sensation and the pressure increased substantially. Something momentous had happened. We scrambled back out of the hottub (much like a walrus would) and back into the house. 7:15pm: 7cm dilated. I felt pressure and yet another gush of warm liquid with each strong contraction—it all felt very messy. We moved to the bedroom where I lay face forward on the bed, sprawled over the bean bag. That bean bag was instrumental to my comfort! With every contraction, Oliver or Julie would put pressure on my sacrum. I felt myself in a bit of a dream-state—the contractions were all-consuming. I was tired from the lack of sleep the night before and actually dozed off for a minute or two between each one. I had read about various coping mechanisms in my natural birth books. I tried various things. Counting just annoyed me. Focusing on something outside myself felt worse. What worked for me was to close my eyes and open my mouth in an “o” shape and to voice a steady “ooooooooooomm” with each contraction. Over, and over again. “ooooooooooooomm”. It must have driven Julie and Oliver close to distraction. In hindsight, I honestly don’t know how they endured listening to that sound every couple of minutes for hours. But, for me, it was absolutely necessary. Time lost all meaning for me while hours slipped by. I remember Julie telling Oliver to go get something to eat. He was still fighting the flu—he must have felt exhausted as well. Every contraction, someone was there putting pressure on my sacrum. 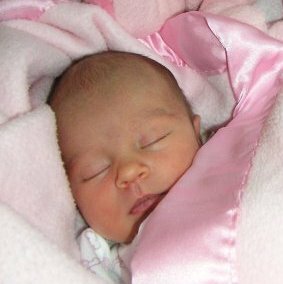 The day after the birth, Julie told me she had been very concerned at this point because I went for several hours without progressing but she never said anything to make me fearful during the birth—she was comforting, attentive and reassuring the entire time. 9:30pm: Something changed. My body arched. I felt an instinctive, guttural, primal urge to push. But, Julie checked—I was still only 7cm dilated and part of my cervix was swollen. She encouraged me to move onto my side to take pressure off the cervix. I switched position and the pressure and contractions immediately increased intensely. I gave each push my all, thinking the harder I pushed, the sooner it would be over. There seemed like an eternity between contractions. Mentally, I knew the pause provided a necessary rest but, emotionally, I was frustrated, feeling like the next contraction would never come. What if the contractions just stopped?! But, the next one always did come and I gave it my all again, and again, and again. Honestly, how long did I have to do this? 11:40pm: They moved me off the birthing stool onto the bed, propped up against that instrumental bean bag chair. Minke said I could reach down and feel the head crowning. I did—it felt like jelly, not like the hard scull I’d envisioned—ugh, I wished I hadn’t felt it! She asked me if I wanted her to hold up a mirror so I could see and I barked back “no!” a little “Birthzilla”-like—I didn’t want to see anything, just to close my eyes and envision the blooming of a rose. The sensation was the most intense now. I felt an intense burning. Every time my mind started to envision the cause of the intense burning (tearing? eek! ), I willed it to stop thinking: “Don’t think, it’s just warmth, don’t think, it’s just warmth.” Julie or Minke applied a cool cloth to my forehead—I didn’t want it. They applied warm cloth to my perineum but I didn’t want that either! I’m not going to lie, I yelled. In the last pushes, my “oooooooomm” turned to “OOOOHHHHHHHHHMMM” and then “AHHHHYYYYAAAAH” with a shrill end-note as the baby’s head cleared those final centimetres. I had watched many a serene water birth on DVD with quiet, calm mothers who seemed to birth their babies without effort (or even with orgasms! )—that wasn’t me. I was glad I wasn’t in a hospital where I would have been self-conscious about making too much noise. Then, the sensation changed. I remember saying “what’s happening?” My baby’s head was out. 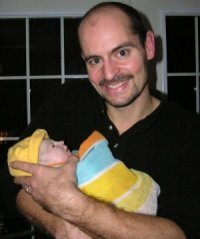 Oliver and Julie told me after that our baby turned her head, opened her eyes and looked up at her daddy before she was all the way out of the birth canal. The umbilical cord was wrapped loosely around her neck; Julie unwrapped it. Finally! Mommy and Ella are very tired. 11:59pm: Next contraction, one more easy push and “bluurrrp”, out gushed our baby with what seemed like an excessive amount of blood-red-tinted liquid, which the midwives reassured me was normal and almost entirely amniotic fluid. Up onto my chest, they lifted our baby. She stared silently up at me with the biggest, blackest eyes I have ever seen. They told me she was a girl. I lifted her leg to confirm—everyone had told us they were sure we were having a boy! I looked down at her and we gazed into one another’s eyes. She didn’t make a sound. After a few minutes, Oliver cut the umbilical cord. 12:11am: One more push for the placenta. Julie showed it to me as she examined it to ensure it was intact. It was heart-shaped (very unusual)! Ella being weighed. 5lbs 11oz. Minke examined, measured and weighed our tiny Ella, 5lbs 11oz. We called parents and closest friends to surprise them with the news despite the late hour. I felt exhilarated and exuberant—like I had conquered the world. We attempted nursing but Ella wasn’t very interested so we just laid skin-to-skin. Ella and I had our herbal bath together. The herbs smelled like garlic—I felt a bit like we were bathing in vegetable soup but it was soothing nevertheless. Minke helped Oliver dress Ella in the hand-me-down sleeper, which was gigantic on her, and bundled her in a towel because we didn’t have any baby blankets yet! Daddy holding baby Ella for the first time! 3:00am: Julie tucked the three of us into bed and left. We were all exhausted. But, I felt like I couldn’t take my eyes off Ella. I kept lifting my head to check her again and again. Ella had no such concerns—she was tired too and slept until morning. Thus began our family.